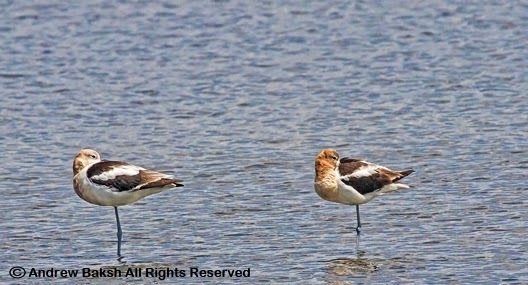 3 American Avocets, a nice East Pond treat. Following my shorebird survey at Cupsogue Long Island on Friday, I was anticipating the arrival of shorebirds at Jamaica Bay and I was not disappointed as I had a total of 15 species on Sunday the 27th. This was the most diversity on the East Pond, since the shorebird migration got underway. Of note were 2 Long-billed Dowitchers one a hulking female and the other a smaller, presumed male. Both birds were well marked plus it helped that they were talkative and the calls are always the clincher when in doubt of the ID. Wilson's Phalarope on the East Pond. Sunday, saw the number of Semipalmated Sandpipers spiking going from 350 to about 2500. There were other increases as well with Short-billed Dowitcher, Semipalmated Plover, Least Sandpiper all increasing. Then on Monday the 28th, we had our first significant shorebird on the pond for the season with 2 American Avocets showing up. That number built to 3 American Avocets on Tuesday the 29th and we also added our first Wilson's Phalarope of the season, the second significant shorebird of the season. In addition, I observed my first juvenile Least Sandpiper, so the juveniles are on their way and we should be seeing more of them. Western Sandpiper on the East Pond. 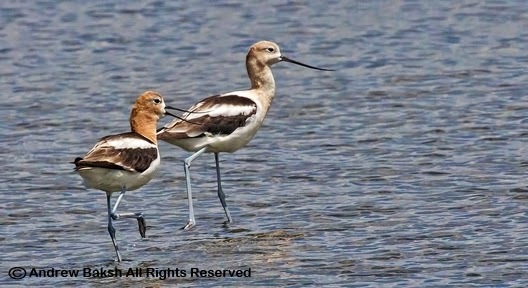 However, by today we were down to one American Avocet on the pond. I did not spend much time looking at the lone Avocet but I would not be surprised if this is an entirely new bird and the three from the 29th all pulled out together. The number of shorebirds on the pond today were much less than what were recorded over the past few days resulting in a few species leaving the pond. Stilt Sandpipers have NOT been seen for 2 consecutive days meaning that the few that were on the pond have likely pulled out. 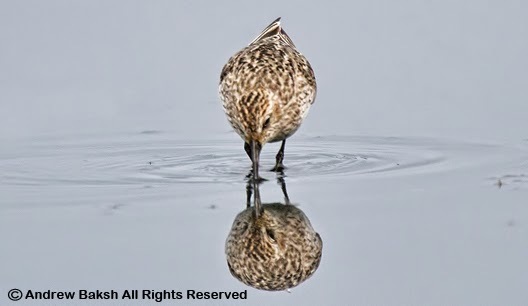 Two Pectoral Sandpipers were seen today and they could have been here yesterday. No Western Sandpipers but they could still be around. 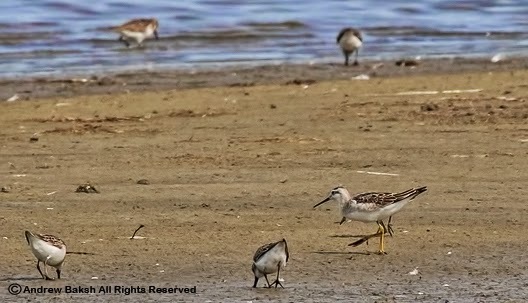 The East Pond is a unique place for shorebirds but in case you forgot, the West Pond was too and is the spot where the legendary MEGA RARE Broad-billed Sandpiper showed up. It is just one of the many reasons to get behind the online petition that the Birders Coalition put together. We must get the WEST POND restored! The link is here. Please sign up if you have not already and don't forget to spread the word. Do it for the birds and wildlife we love! Juvenile and adult Royal Terns center. Note the bill and leg color of the juvenile. I am a little late with this post, but better late than never. With the low numbers of shorebirds being reported from various sites last week, I decided to switch sites and do a shorebird survey out on Long Island. The site I chose was Cupsogue, one of my favorite spots not just for the Margaritas after birding but because it is a different scene than Jamaica Bay. Plus, it has different variety of birds and I could also throw in a seawatch. A good look size comparison. SESA on the left and SAND on the right. Last Friday morning, I was joined on the flats by Ken and Sue Feustel and together we sifted through the shorebirds. There were ample but not an overwhelming number of birds but from what I saw, I was encouraged that perhaps Jamaica Bay might see some new arrivals (more on that in another post). After several hours, Ken and Sue departed and I stayed enjoying exploring the flats and trying to find as many Piping Plovers as possible. I ended up with 10 PIPL, 3 of which were banded. I also observed and documented a banded Sanderling. Hudsonian Godwit the larger shorebird. Note the size compared to the SBDO. I was having a good time studying the common birds and felt the day was a success. It got better as I picked up a couple of unexpected birds towards the end of my stay. First two Royal Terns showed up (adult and juvenile), then a Whimbrel blew by and last but not least, the best bird of the day was a Hudsonian Godwit, which touched down for a few minutes before lifting off and disappearing. In all, I ended up with 20 species of shorebirds, which I thought was a very good number given the low numbers of shorebirds that were being reported across the state. As you will read in subsequent posts, the numbers did spike at Jamaica Bay, but you will have to check back to read the details of that report. 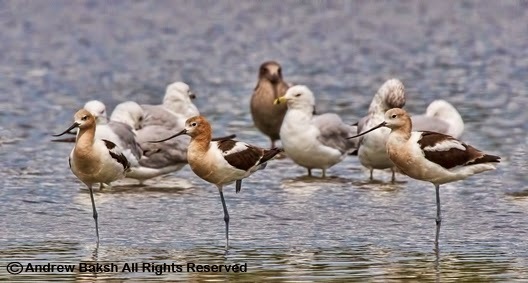 American Avocets have showed up in several places around the state this year, including a rare occurrence in Inwood Manhattan. I kept thinking that we were due at Jamaica Bay although I acknowledge that it is not a bird to expect every year. This morning I was pleasantly surprised to find two birds,a male and female sleeping on the East Pond. I quickly put together a post for our bird list serves but only moments later much to my dismay, they flew heading east off the pond. I remained hopeful that they would return and kept a watchful eye out. After a while, I picked them up as they came back in again and I was relieved that other birders might get them. Sean Sime and Corey Finger who I left watching the birds were two other birders who came out and got looks. Other notable shorebirds on the East Pond this morning included PECTORAL SANDPIPER, STILT SANDPIPER, WESTERN SANDPIPER and LONG-BILLED DOWITCHER. The latter was one of the two seen yesterday as I deemed it a male from the size. No sign of the hulking female LBDO but the Dowitcher numbers were down, so she could have pulled out. Sean Sime, reported having PECTORAL, STILT and WESTERN SANDPIPER all on the south when I was looking at the same on the North End, so there are multiples on the pond. One just have to look for them. 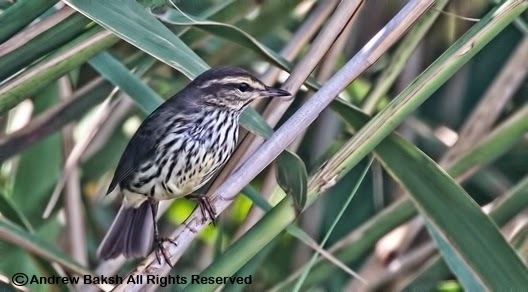 The other notable bird this morning that was not a shorebird was a Northern Waterthrush. Observed on the north end, its presence was betrayed a chip note and it took me bit but finally, I tracked it down and even managed a photo. Hopefully, the Avocets stick around for others to see. It is past mid July and unfortunately it remains a struggle to get the water level on the East Pond at Jamaica Bay Wildlife Refuge, where it should be for this time of the year. While the recent storms did not help the water level situation. If the pond was drained as it should, we would not be faced with the issue we have today. Water level, still remains high on the north end and I keep checking it almost daily to ensue that the level, is dropping. The pond needs to be drained down another 3 inches for sufficient shoreline to open up on the north end. On the positive side, decent shoreline has opened up on the south end and east side of the pond, providing ample places for birds to feed and roost. However, there have been very few shorebirds around. Why and where are they? 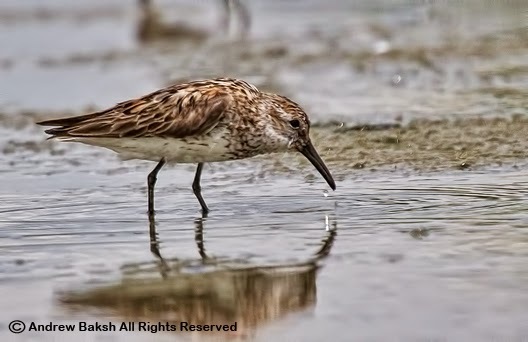 Perhaps, the high water level encouraged shorebirds, to bypass the pond or we have yet to see a big arrival, but it is getting late and a cause for concern. 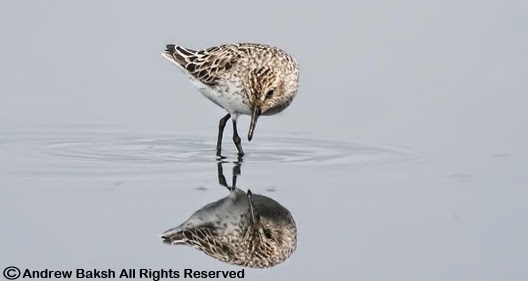 Compared to data over the last few years, the number of shorebirds on the pond this year have been downright disheartening. I keep thinking we are due for a big influx, but it has not happened as of yet. 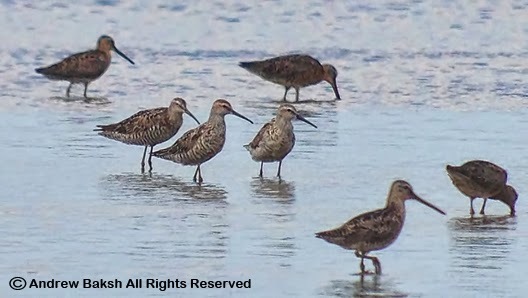 Since my report on July 14th that saw some decent numbers, the count has been less than 300 shorebirds in total on several days with only the last day or two that numbers are up slightly but still remain way below what is expected. In fact, the numbers are so low that breaking 500 shorebirds in total has been difficult over the past few days. This is a VERY poor showing as by now, Short-billed Dowitcher numbers should have been peaking with several thousand birds. To ensure that I am not missing a trick, I have birded the pond on two tide cycles and often times spend several hours doing my observation before and after high tides. So, I am confident my data is pretty darn close to being accurate when it comes to the number of shorebirds on the pond. The next few days will be very important in terms of data and surveying as the pond level, is near where it was before the storms came. Maybe eventually, we might see a huge surge in numbers with a new front. I sure hope so because it has been really depressing to compare the numbers and see the drop off between this and last year. Keep checking the blog for more shorebird reports from Jamaica Bay and if you go, please post a report on the list serves. A few comments about the comparison of the two reports. I had one Willet (Eastern juvenile) two days ago, so that is a wash. Stilt Sandpipers (Calidris Himantopus) numbers fluctuate and 2012 and 2013 saw really excellent numbers; I don't expect to see high numbers of Stilts every year. The red flag, is when comparing data with the more common species, like SBDO and SESA. Short-billed Dowitcher numbers would have peaked by now and beginning to drop off. So far this year, I have not recorded the highs normally associated for this time of the year. 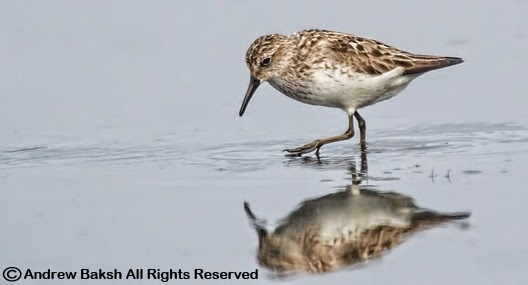 In addition, the lack of Semipalmated Sandpiper numbers are also one for concern. Are the numbers low because of the pond condition (water level) or are the birds late? We shall see. The lack of shorebirds has allowed me some extra time to spend on the other pond inhabitants and I have turned up a few interesting ones. Like this Bonaparte's Gull for example. Last seen on July 20th. Or how about this trio of unusual birds in one frame. From L-R, a male Greater Scaup, female Hooded Merganser and a female Greater Scaup. 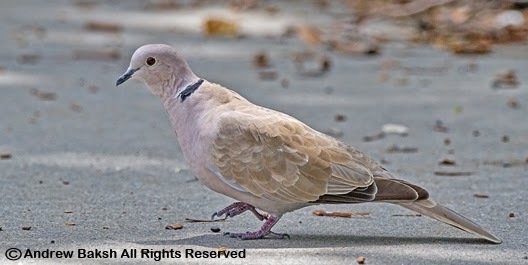 It was only a matter of time before one showed in one of the 5 Boroughs and so on June 22nd, when David Ringer reported that he had found an apparent Eurasian Collared-Dove at the northwest corner of Pier 63 in Chelsea Manhattan, I was interested. I was on the flats at Cupsogue Long Island, when the report came in and when I looked at the photos on my phone, I was not entirely sure. A few inquires confirmed that Mr. Ringer's report should be considered a serious one, so I waited until I got home and looked at the photos again. It looked good. But I procrastinated, after all shorebird season was around the corner and I was busy with NPS (National Park Service) getting the East Pond ready. Finally, last Thursday on my way to a lunch date, I made it out to Chelsea Waterside Park and after about an hour and 45 minutes, I found and then was able to study the Eurasian Collared-Dove for a while. I first spotted the bird as I crossed the highway having decided that I had spent enough time looking. I darted back across the highway to pick it up sitting in a London Plane Tree. This is what it looked like looking at it from below. Note how the black in the outer web of the outside retrices extends well beyond the longest undertail covert in the Eurasian Collared-Dove? Ringed Turtle Dove, has less of a black base to the tail feathers and this never extends beyond the longest undertail coverts. 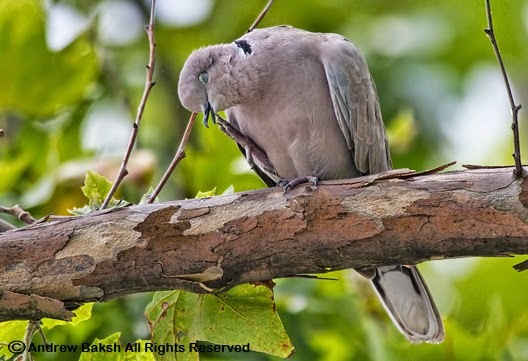 Note that juvenile Eurasian Collared-Dove does not have that much black and in some cases, the dark outer web is almost completely missing from the tail feathers. In these instances other field marks come into play when separating from other like species such as Ringed Turtle Dove. The imminent Eurasian Collared-Doves invasion of the US began when some 50 birds escaped captivity in the Bahamas around 1974. Within ten years, the population had multiplied significantly to several thousands. By the mid-1980s, the Eurasian Collared-Dove showed up in Florida and from there, rapidly expanded its numbers and range. I think if this bird survives our winter, we could see more showing up in the other Boroughs. Note the dark primaries, the pinkish tone to the breast and the neck collar. 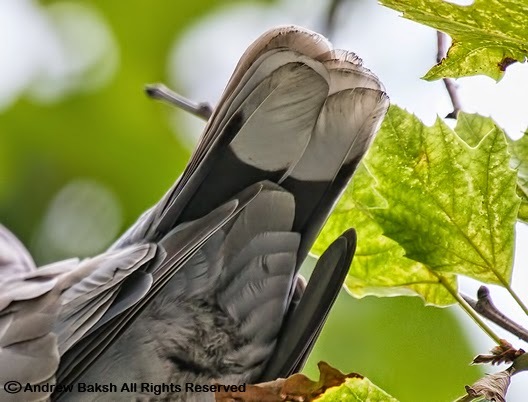 Bill Hubick Photography has a page with some good photos of Eurasian Collared-Doves and Ringed Turtle Doves. He points out some of the ID nuances in identifying EUCD. His page is worth a look, for those of you interested in learning ID pitfalls associated with Streptopelia Doves. If you think it can't be hard identifying a Eurasian Collared-Dove in the field, check out this Streptopelia Dove that Steve Walter found and photographed at Alley Pond Park Environmental Center in Queens NY on July 10th. Steve and I concluded after some studying that this bird was not a Eurasian Collared-Dove, but looked more like an African Collared-Dove also known as Ringed Turtle Dove. 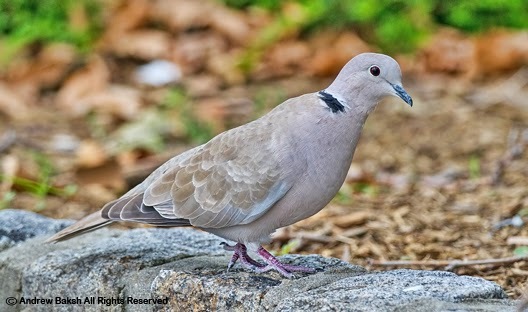 Shortly after Steve's report, yet another Streptopelia dove was reported in Inwood Park Manhattan and several birders were eBirding this bird as a Eurasian Collared-Dove. It was only after one birder posted video footage and photos on Facebook, that a couple of sharp eyed birders called into question the ID. At this point, that bird, is suspected to be a Ringed Turtle Dove. I was hoping to acquire photos of the Inwood bird before going live with this report, but I may have to do an update if I get permission to use photos of the Inwood bird in this post. Hopefully, the photos here will help birders in identifying the next EUCD that shows up, which I would prefer to be in Queens. This banded Red Knot was observed and documented on 5-13-2014 at Pikes Beach Long Island NY. Subsequently, I reported the band code, "A6T" to the banding laboratory and after a few weeks, received the following information from Patricia Gonzalez who is the Global Flyway Network Coordinator based in Argentina. 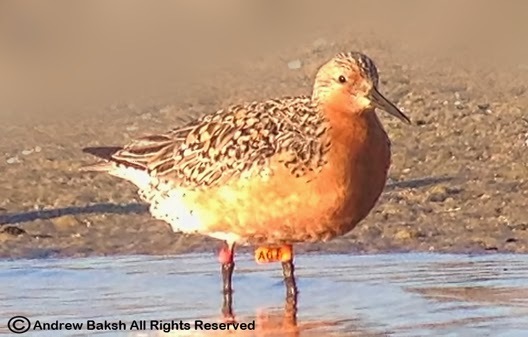 "This red knot was banded with the metal band 9822-04647 with orange flag A6T at Río Grande, Tierra del Fuego, Argentina, 8 / Nov / 2007 under Fundación Inalafquen (Argentina), Royal Ontario Museum (Toronto) and Museo de la Ciudad (Rio Grande, Arg) banding expedition. After that it was seen several times in Rio Grande during austral summer, in Delaware Bay and also in Mingan Archipelago Reserve of Parcs Canada in Quebec when coming back from the Arctic. I am happy to see in the picture that the bird looks in great condition (I remember few days before this sighting there were important thunderstorms in Delaware Bay, NEast shores of New Jersey, I guess NY as well)." 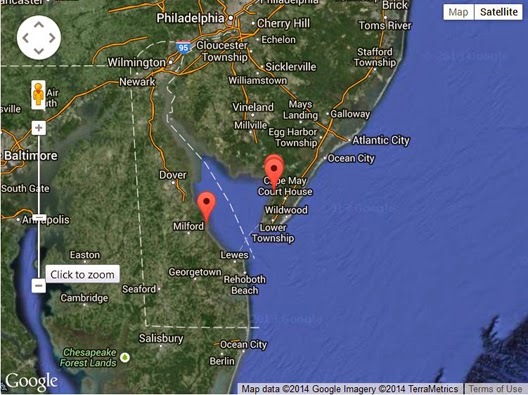 Here is a snapshot of the mapped re-sightings with some of the details. Note the report of this bird from the West Hampton Beach vicinity on 5-29-2010.
Who is this that looks just like me?